This past week was brutally hot. I was completely wilted at the end of each workday. Everything we ate for dinner last week was grilled because after hot days in other people's kitchen's I couldn't bear to turn on my stove. This morning we woke up to a cool, dry day. One of my first thoughts was "hooray, I can use the stove again!" I had some ground turkey that I needed to cook, so I made Taco Stuffed Peppers. I was planning to save these for my lunches this week and to bake some chicken for dinner, but Tom smelled the taco meat mixture cooking and asked if we could have them for dinner tonight. We'll have the chicken tomorrow. Slice tops off peppers. Keeping peppers whole, core and seed the peppers. Dice pepper tops and set aside. Place peppers cut side down in a rimmed baking pan. Bake for 20 minutes, or until peppers are just softened. When peppers are soft, remove from oven and set aside. Spray a dutch oven with olive oil spray. Heat over medium heat. Add ground turkey and brown the turkey. Add onion and diced pepper tops and cook until the onions and peppers are tender. Add cumin, chili powder, tomato paste, and diced tomatoes with green chiles. Simmer for 10 minutes. Adjust seasoning by adding cumin, chili pepper, salt, and black pepper to taste. 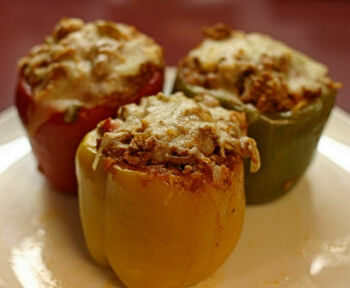 Spoon turkey mixture into peppers and place peppers in a baking dish. Sprinkle cheese over peppers. Bake at 350F for 10 minutes or until cheese is melted.